We all know what an average is - add the numbers together and divide by how many there are. A moving average filter does just that. It stores a history of the last 'N' numbers and outputs their average. Every time a new number comes in, the average is effectively recalculated from the stored samples and a new number is output. 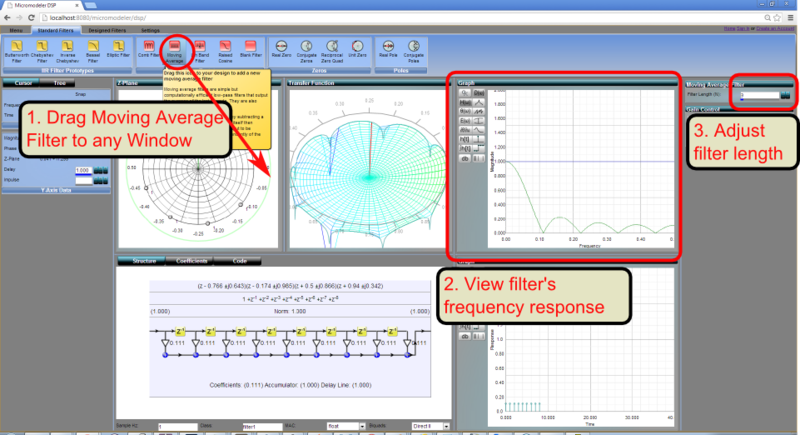 At the top-right, we see the graph of Magnitude vs Frequency, or how much different frequencies will be amplified or reduced by the moving average filter. As you might expect, averaging the last N samples will apply some type of smoothing to the signal, retaining the low frequencies and removing the high frequencies. 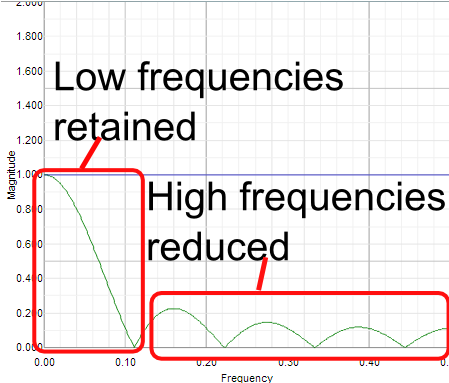 We can control the number of previous inputs, or samples that it averages by adjusting the filter length, N. By adjusting this, we can see that we have some basic control over which frequencies can pass and which are discarded. If we look at the structure view, we can see what the inside of a moving average filter might look like. The diagram has been annotated to show what the different symbols mean. The Z-1 symbols mean delay by one time sample and the + symbols mean add, or combine the signals. The arrows mean multiply (think amplify, reduce or scale) the signal by the amount shown to the right of the arrow. For an average of 5 samples, we take one fifth (0.2) of the most recent sample, one fifth of the second most recent sample and so on. The chain of delays is called a delay line with the input signal being delayed by one additional time step as you proceed along the delay line. The arrows are also called taps, so you could almost imagine them as being taps like the one in your kitchen sink that are all one fifth open. You could imagine the signal flowing in from the left and being progressively delayed as it moves along the delay line, then recombined in different strengths through the taps to form the output. In practice the code generated by MicroModeler DSP will use tricks to do this more efficiently, so that only first and last samples need to be involved, but the diagram is good for illustrative purposes. If you can understand this then you can get an idea what an FIR filter is. An FIR filter is identical to the moving average filter but instead of all the tap strengths being the same, they can be different. Here we have a moving average filter and an FIR filter. You can see that they are structurally the same, the only difference being the strengths of the taps. The next section will introduce you to Finite Impulse Response (FIR) filters. By varying the tap strengths, we can create close to any frequency response that we want.